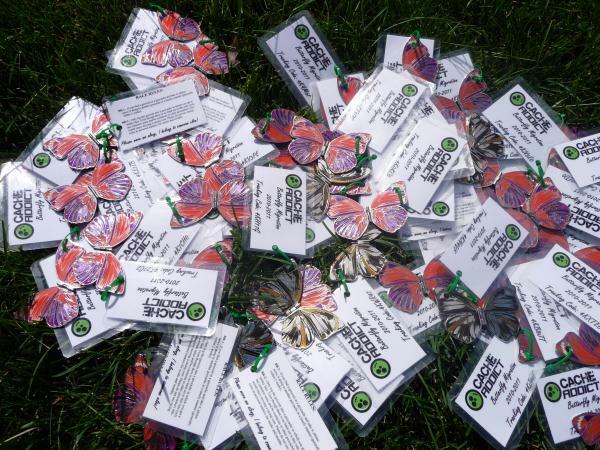 The only racers in this race will be butterflies migrating from one GeoCoinFest to another. 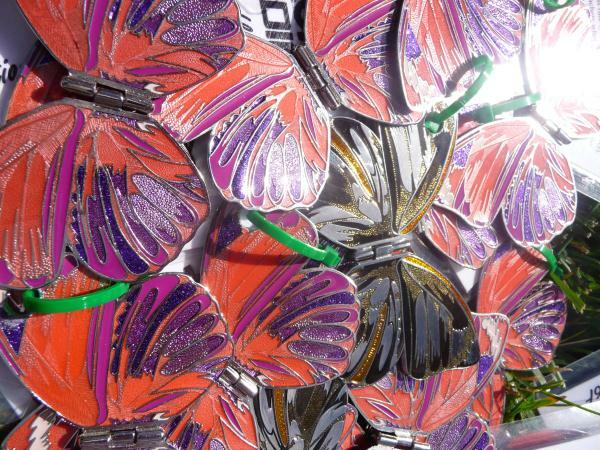 All Butterflies must be purchased at CacheAddict.com, they are listed here. All racers are listed for $6.50 and will be tagged with a plastic bubby indicating it is in the race and would like to be moved. Make sure to use discount code RACE for free shipping. Space is limited so get into this race quick!!! I will provide you with the tracking number in order to activate the coin and some HTML code to add to the coin page. 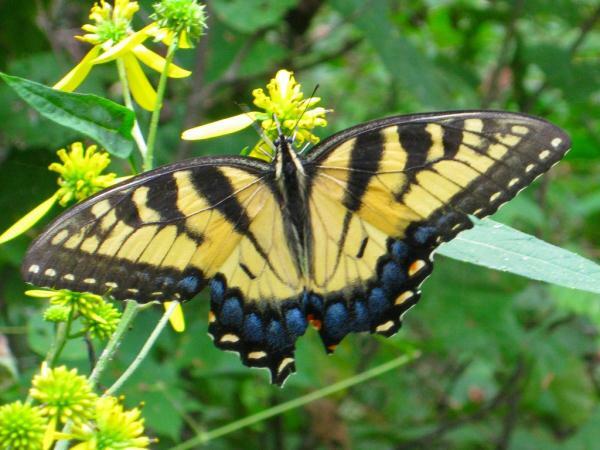 This information will have a link to the race info and information about the race and that the Butterfly would like to continue its migration. Here is a picture of the Butterflies that will take this migration trip. 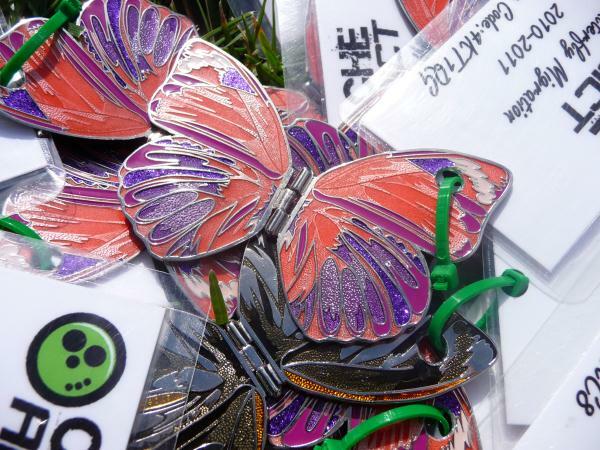 - A geocacher may enter up to a maximum of 5 Butterfly 2010 from Cache Addict in the race. - Prizes will be awarded to the top racer based on greatest distance traveled and for most placements by different geocachers. - If the same coin wins both categories, then the prize for most geocachers will go to the 2nd place coin in that category. - In case of a tie in either of the categories, a tie breaker criteria will be established. - All prize winners will be contacted for their mailing information so I know where to mail their prizes to. - Racer standings will be updated on a regular basis. I like this idea, ordered 2. I wanted to make sure some of these beautiful coins get out into the wild! Ordered 2. Fun idea! I can't bear to release my blue butterfly that I already purchased (especially after my Blue Morpho disappeared), but it should be easier when they'll never be in my hands. I joined the race. Now I hope at least one of the coins will make it to Geocoinfest 2011. After the race I will change the goal in to reaching me in the Netherlands. Maybe a coin will make it. But I'm glad I already have the complete series in hand (album). ordered two for the kids. They should enjoy the race. Sounds like fun!! I got me a few to add to the race. Good luck fellows! Ok, I'm in with 2. I don't expect many will make it very far but perhaps, just as with fish spawning or sea turtles hatching, with so many being released at least a few will make it. Shadow's Friend and I are in the race! Should be fun. Got one for both Eli and myself. Fun idea! Are the butterfly colors going to be randomly chosen, or are they all the pink variety? It doesn't matter, other than for the mental image I have in my head of all these butterflies "flying off" from GCF. Two more "migrants" enter the race: one for myself and one for my sister, Echo Echo. Geocoin races are such fun! Here's to hoping more than a few of these winged coins make their destination, and then other destinations afterwards! What a great idea, I couldn`t resist and ordered two. Gorillagal reminded me of this today....... so I purchased 2. Cool! I hope to see some butterflies in the wild soon! 2 for me entered into the race. I jumped on in too. I was just debating what one I wanted to release from my collection...I love them all so much I hate to let them out of my sight, so this was a good solution and I love the idea of a race! I grabbed two. Space is limited, only have about 20 left. When might we receive information to activate our racing butterflies? I wasn't sure how soon before GCF we should prepare our pages so that my butterfly can win race. I am going to try and contact everyone this weekend or early next week. If you have any left before I leave for GCF, I'll take the rest and get them activated. Keep me posted week of. I have only 12 left for this migration. All order need to be placed by Friday, September 10. Mine are in the race, activated and dropped off. Ok, maybe I'm blind but I did read over all emails regarding these butterflies ("Butterfly Migration Race Information and Tracking Numbers", "Update to trackable page" and "RE: Update to trackable page") and did not see Activation Codes anywhere in any of them. Where did y'all get your Activation Codes, please? I'm going out on a limb, but since they're regular "stock" butterflies, I would bet he has the codes listed at his site. Or he used a single keyword for the whole lot. He didn't make these special for the race. Activation code for Cache Addict coins can be found here: http://www.cacheaddict.com/activate.php. As others have mentioned you can now get some codes at my site. I have been having issues with coincodes and I am in the process of loading all my codes on my own site. These all happen to be CACHE. Butterflies entered into the Race! Go li'l flutterbys! OK...... got both of my butterflies activated and placed in the starting box. Going fast, only 5 left! My coins have been activated, html added and they're in the box. I might just put all other coins on my watchlist to see how they're are going next year. We will have 70 butterflies in this migration!!! I have sold out. ARGH!! I missed the sign up. We should try and get a picture of the Migration!! Am I correct in understanding that we release them in caches near/around GCF 2010 with the mission of making it to wherever the next GCF is? I'll second that emotion! I think it would be exciting to be one of the first geocachers to help racers at the starting line. Since I can't be one of them but do have a racer, I'd love to see how they start out. Even a photo of one of them with their mission instructions, guidlines, etc. I'm trying to make sure I do this correctly! When it asks for "Date Activated:" what date do I put? And also "Location Activated:" Do I put Minnesota? EDIT: Phooey, I think I messed up already! I clicked sumbit too soon and set the date as today and the location as Minn., is that alright?!?! Any date and location is ok! A pretty picture that I took this weekend, I think it is a send off for these racers! I finally got mine activated, but I accidentally deleted a couple of your instruction emails, so I'm not sure I got all the info on the coin pages. Email sent to you CacheAddict. All racers have escaped from their cocoon and if they make it through airport security, will be ready to race.